Jeddah, 10 January 2011 – Saudi Arabian Airlines, the flag carrier of Saudi Arabia, today signed an agreement to join SkyTeam in 2012. The airline will be SkyTeam’s first member from the Middle East, adding 35 new destinations to the alliance network. SkyTeam members will have access to new potential customers from the region as Saudi Arabian Airlines offers direct flights to Europe, Asia, Africa and the USA. 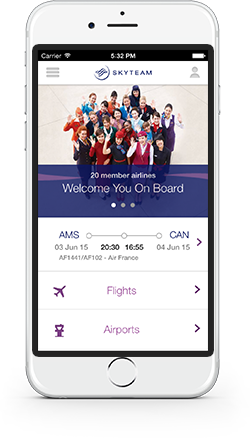 Customers can transfer to SkyTeam partner flights via hubs such as Paris, Rome, Nairobi and New York. SkyTeam partner China Southern also offers regular connections to Asia from Jeddah. Saudi Arabian Airlines is fully focused on its four-year turnaround program to be completed by 2013. Key elements of this plan include modernization of its infrastructure, restructuring of its domestic and international network and implementing its fleet modernization plan through the purchase of the most advanced aircraft.